Venezuela, or 'Little Venice' as named by Columbus, rich in resources and home to some of the most beautiful people in the world provides a good cruising destination out of the hurricane belt. Venezuela, the northernmost country in South America would seem to have it all; unfortunately a culture of corruption at all levels oppresses the people and keeps them poor while a few hide their riches offshore. The local population is very friendly and cruisers are welcomed, although dinghy and outboard theft is a problem in many places. This is the main cruising destination, with marinas such as CMO (Centro Marino del Oriente), Mare-Mare (with room service for your boat), and El Moro. Labor is cheap, although not as efficient as elsewhere, food and restaurants are cheap (hard to spend more than $US10 for a good meal), and parts arrive quickly from the US or Europe. Be careful with money - a friend lost $1000 when thieves switched a packet of money on him in Banco Union when he took out a cash advance - we think bank officials must have been in on it. Los Testigos - small, barren islands with friendly fishermen. 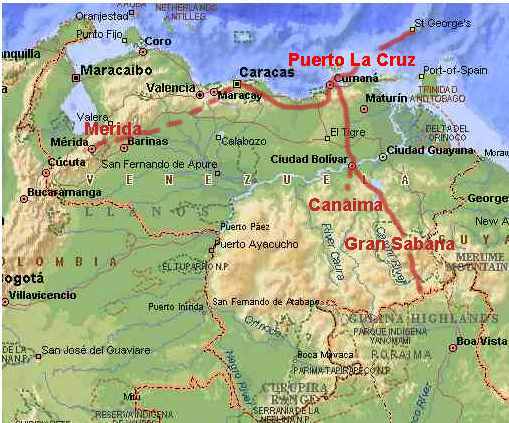 They are on the route from Grenada to Venezuela. Margarita - a plush resort island, playground to wealthy Venezuelans with duty-free stores, crowded anchorages, great shops, and its own immigration bureaucracy. La Tortuga - attractive, dry island, we spent 1 night but did not go ashore. Los Roques - beautiful islands with prolific bird life; they get lots of traffic from the mainland, both power boats and airplane tours. We stopped at Francis Bay, Crasqui, and Carenero and found them all to be secure anchorages. High plateaus and mesas, inspiration for Doyle's "Lost Worlds", cover the south-east of Venezuela. Flights to Canaima are frequent where one can see thundering falls similar to Niagara, or the amazing 3200' Angel Falls - highest in the world. We rented a 4-wheel drive to travel throughout the Gran Sabana from Ciudad Bolivar - sights included a riverbed of solid jasper, bird life, festivals on the banks of the Orinoco river, and river tours that end at the top of the waterfall to the right . High in the snow-capped Andes, this clean town offers beautiful scenery, a cable-car ride to 14,000', stays at an old monastery, and mostly friendly people. Keep jewelry out of sight - Judi had a gold chain ripped off her neck in broad daylight. It is a 3-hour flight or 24 hour bus ride from Puerto la Cruz. The capital city of Venezuela, streets are clogged with traffic and fumes fill the air. Despite this, the weather is pleasant at 3000', the Natural Science and Arts museums are interesting and 440 years of history is represented in many historic buildings and squares. Pickpockets operate in the subway - we were targeted, but surprised them with our command of Spanish and loud voices. It also serves as a departure point to visit Colonia Tovar, a German Bavarian enclave established in the 1800's that remained intact until the 1950's and is a cool, mountain escape from the cities. 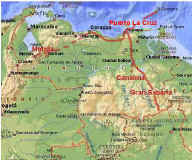 The international airport, a short ride from Caracas, provides frequent access to the USA and Europe.